Despite being one of Surrey's largest and oldest ethnic minorities, references to Gypsy Romany and Traveller peoples are often hidden within the historical record. This makes tracing Traveller ancestry a challenge but with a bit of detective work sources can be unearthed and Surrey Heritage holds an array of archives, photographs and published works to help you. Gypsies are thought to have arrived in Britain from the northern Indian sub-continent around 1500. The Romany language has its roots in Hindi but suggests a migration via the Middle East into South Eastern Europe. The first reference to Gypsies in England occurs in 1514 and as it was believed they came from Egypt they were first called 'Egyptians'. Roma Gypsies came to England from Eastern Europe just prior to the First World War and again after tensions in the 1930s. From 1956 Hungarian Gypsies have come to England. Identifying historical records is particularly difficult because of the different words used to refer to the Travelling community and to describe their lifestyle. Even today, family history publications use Romany and Gypsy interchangeably. Spellings may also vary in historical records including many variant spellings of Gypsy, such as Gipsy, Gipsie and so on. Welsh Gypsies share the same heritage as English Gypsies, but Scottish and Irish Gypsies and Irish Travellers are all distinct ethnic groups; the latter are often referred to in parish registers as 'Pavees' or 'Minceir'. Historically you may find any of the following terms used: Traveller, vagrant, stroller, tramp/tramper, bargee, sojourner (temporary resident), of no fixed abode, living in tent, van dweller, show, fair and circus people. The words Roma, Romany and Romani, Sinti, Kalderash and Gitano may also be used. A quick glance at the legislation and punishments in England for being termed a Gypsy will show you why researching travelling ancestors can be difficult. The Egyptians Act of 1530 aimed at ridding the country of them, and further acts up until the early eighteenth century enforced banishment, transportation, fines, servitude or death. Not surprisingly, many wished to keep a low profile and as time went on this encouraged a culture of secrecy which is reflected in the lack of surviving records. Ceremonies such as weddings often remained strictly family affairs. Difficult relations between communities and the stigma of Gypsy ancestry can also make research a challenge. Talk to older relatives for clues and family stories. Old family photos can help to identify Gypsy heritage. Photographs taken at gatherings such as hop picking or fairs might be a sign, although these were often annual events which brought together families from many backgrounds, not just Gypsies and Travellers. Oral traditions are strong within the community and although often mixed with English, the Romany language is still in use in the UK; listen closely when older family members speak, joke or quarrel. Use online genealogy indexes with caution. Transcription errors with travelling names are rife and many indexes are incomplete. The Romany and Traveller Family History Society journal Romany Routes, includes information about British Traveller families and sources for research; Surrey History Centre holds a good collection of these journals. The Romany and Traveller Family History Society website is crammed with useful advice and information. Ceremonies were often carried out when families were together for picking, so when using parish records you may also want to find out when and where certain crops were grown. Group baptisms often occur simply because families all happened to be together whilst in the vicinity of a parish church. By the eighteenth century, a third of all Gypsies in every generation 'married out' of their race, so with this in mind, the normal methods of family history research also apply. These are a distinctive group often not viewed as part of the Travelling community. A fairground worker, or showman, might be recorded as a stallholder, amusement caterer, roundabout proprietor or hawker. The National Fairground Archive (NFA) suggests that a show family in the early 1900s is most likely to be still associated with the fairground today. Family history in this regard is simple - the child is born into the fair and marries within the fair. Active show families have a keen sense of family history and marriages were often seen as important business alliances. The National Fairground Archive are the experts in this area of genealogy and the National Fairground Archive website contains a family history section. Historically, ancestors with itinerant occupations may be recorded as hawkers or pedlars but not all were Gypsies. The same applies to the many agricultural labourers living in tents listed in the Surrey census returns. 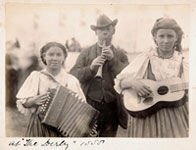 The Romany and Traveller Family History Society website contains a list of trades and occupations traditionally associated with travelling ancestors, including horse dealers, basket makers, beehive makers, knife grinders, tinkers, peg makers, blacksmiths and entertainers. From the 1780s, as anti-Gypsy legislation was gradually repealed, Gypsies became a useful source of cheap labour in the fields; some also worked as blacksmiths and entertainers. In the nineteenth century, following the mechanisation of farming, travelling life changed drastically. With the decrease in picking work, families had to adapt and many Gypsies moved from rural areas to cities and towns to become settled. In the late nineteenth century numerous Gypsy families travelled to America. In the twentieth century, with the onset of motorisation, traditional travelling patterns changed, and routes travelled by families for hundreds of years were lost. In more recent times Traveller men have provided vital labour for building roads and motorways. The RTFHS website includes lists of surnames that frequently occur in the Gypsy and Traveller community. Gypsy surnames which occur in Surrey include Cooper, Matthews, Ayres, Smith, Green, Taylor, Williams, Brazil, Shepherd, Beaney, Chapman and Scott among others. The Gypsy Lore Society Collections at Liverpool University may be able to help with researching well-known surnames. Robert Dawson, Gypsy expert, holds a list of nearly every Gypsy surname in the country. Exotic, mythical or Biblical names such as Sampson, Nelson, Liberty, Britannia or Cinderella were popular and can be a sign of Gypsy ancestry. For Gypsy adoptions and children taken into care, Robert Dawson suggests it is best to contact your local Social Services department. Although Gypsies and Travellers cannot be distinguished by their religion, there have been periods in which evangelical movements have had strong followings in these communities. Some more remote churches constructed in the nineteenth century may have specifically served the Gypsy community, such as St. Michael's Mission Hall on Epsom Common. More recently, the chapel at Salvation Place, Leatherhead, was purpose-built to serve the Traveller community. It is important to remember that many travelling families have been settled for generations. Some families chose to go into housing, others were forced to do so by economic or social circumstances. Traditionally, most Gypsies lived in tents, although travelling vans became popular in the mid-nineteenth century. Areas of Surrey's heathland and around bridges, rivers and estates may prove worthwhile for tracking down travelling ancestors; some regularly pitched tents by Walton and Chertsey bridges. Gypsies and Travellers may have passed through Surrey into other counties, so it is worth checking the collections of neighbouring county record offices. Check when events associated with the Travelling community were held, such as race meetings and horse fairs, which would have attracted Travelling families countrywide as a place of meeting and dealing. The Epsom Derby occurs in June and is a traditional annual gathering point for Gypsies from Surrey and beyond and the census returns regularly record Gypsy families camping on the Epsom Downs. Opportunities for seasonal work around the country led people to spend winter in one place, start early farm work shortly after Easter (e.g daffodil picking in the West Country), then join harvest teams between June and October. The summer months also traditionally provided work opportunities in coastal resorts. This Surrey Heritage project aimed to encourage greater access to Surrey's museums, libraries and archives for the region's large Gypsy and Traveller population. Details of the report are available on our Roads to Your Past webpage. If you have material relating to Gypsies and Travellers in Surrey we would be delighted to hear from you. Please see Gypsy Romany and Traveller sources held at Surrey History Centre. The Gypsy Genealogy website supplements the R&TFHS publications and contains many useful research tips. The community magazine Travellers' Times contains both current and historical information about the Travelling community and promotes Gypsy Roma Traveller History Month. Terence Lee's A-Z of Gypsy Genealogies is hosted on the Romanies Reunited website and contains many Surrey travelling families.